All of the victims of the Irish property scam are not equally innocent and the reason for bailing out many of them is the same as that for bailing out the banks. Let’s be clear. This was an Irish scam. Lending companies had access to lots of relatively cheap “international” money. This was “imported” and lent to the relatively poor so that extraordinary property prices could be paid to the rich. In terms of page-one economics the price of a house was determined by whatever people were prepared to pay. 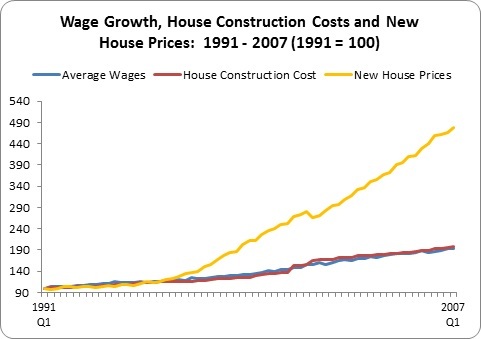 The graph shows that income and costs increased steadily but house prices took off on a bewildering upward trajectory. Traditional lending conventions linking income with loan size were dropped in order to maximise borrowing and this made large payments to the rich chancers possible ( https://colummccaffery.wordpress.com/2012/05/27/if-the-banks-and-building-societies-were-giving-crazy-loans-which-could-not-be-repayed-by-how-much-should-we-penalise-both-their-and-their-customers-foolishness/&#8221; ). The scam was greased by making some people desperate (“You need to get on the property ladder.”) and by convincing others that they too could be successful speculators (“It’s a no brainer; property prices don’t fall in Ireland.”). It is, however, a mistake to view all of the victims of the scam as blameless. No matter how many times managers and media encourage a person to be foolish there remains a personal obligation to be prudent. Of course there are times when a scam is so well done that little or no blame can attach to the victim but that is not the case in relation to the Irish lending scam. Despite the elite chatter and media torrent in support of foolishness, ordinary conversations about the dangers were commonplace and there were many warning voices which could have been heeded. Moreover, as the scam developed there was increasing concrete evidence in plain sight sufficient to warn all but the wilfully blind or the addicted risk-taker. Young people are particularly vulnerable to scams and are often preyed upon. The property scam was no exception. The pressure to “get on the property ladder” was relentless and in a just world a nasty fate would await anyone who dispensed this advice – especially when it was dispensed as it became more and more clear that the end was approaching. Mature victims drawn into a reckless gamble were less vulnerable and their fellow citizens should be less forgiving of their stupidity and/or avarice. The argument that the victims should be bailed out for reasons different to those offered for baling out the banks is untenable. There was no moral or legal reason for baling out banks. Leaving aside young people and cases where no blame could attach, there is no moral or legal reason to bail out victims of the scam either. However, a functioning liberal economy or the view that these people in aggregate qualify as “too big to fail” may be very good reasons why careful, thinking citizens will have to bail out these people as well as the banks.